Le Chameau Traqueur Wellingtons. 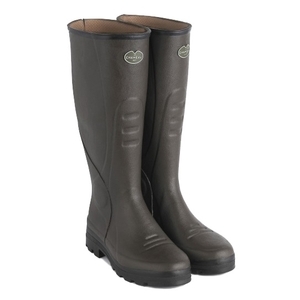 Hunting tracker boot with watertight Aquazip rear zip. Kevlar reinforcement on the front foot of the boot for complete protection from abrasion. 100% micro-fibre Onsteam lining, easily absorbs and dissipates humidity, thermo-regulating, anti-allergy. Total comfort and completely dry inside the boot. High resistance to abrasion and tearing. Bi-density grip sole, all terrain grip. Shank reinforcement for better arch support. Bought for use in rough forestry fit is goodnot worn outside yet but look sturdy enough. Nice boot. Not the easiest to get on past the ankle but once on they hold the foot well.The inner sole is firm unlike some expensive wellies through which you can uncomfortably feel the treads.The treads themselves I believe are vibram the should last well and give an excellent grip.I like the zip at the rear out of the way of snagging.